Year 5 have recently been learning about the Earth, the Sun and the Moon as part of their Science topic this term. Part of their new learning was to investigate how we get night and day, how the moon appears to shine and also how the moon appears to change shape in the night sky. As a school, we don’t only aim to inform but also to inspire and it is always great to see when individuals are enthused to use their learning in new and different ways. So, imagine the surprise when on a normal Tuesday morning Thomas arrived at school with a newly baked cake. On the cake, beautifully iced and decorated were the unmistakable images of the Sun, the Earth and the Moon. 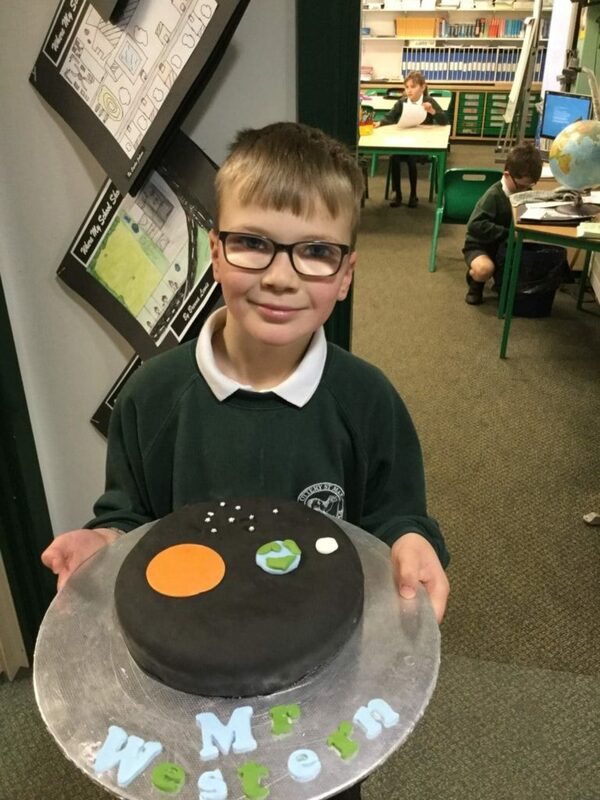 Inspired by the work we had been doing in the class he had asked his mum if he could bake a ‘Space’ cake and fortunately for us, she rather kindly agreed. Well done Thomas for taking your learning and enthusiasm that little bit further!!! New learning can be delicious….